[map] South of Juniper Drive NW off Pulaskai Pike NW. [Picture] Image showing the station's PAD data for the main HD channel as of January 2015, with an updated slogan. [Picture] Image showing the station's PAD data for the main HD channel. [Picture] Image showing the station's PAD data for the HD-2 channel, "106.5 Kiss FM". [Picture] Image showing the RDS data on an Insignia portable radio, with the Radio Text and PS (call sign) fields shown. [Studio] Google Photos image of the iHeartMedia Huntsville studios. [Studio] Street View imagery of the iHeartMedia studios on Peoples Road in Madison. This frequency goes back to WVNA-FM, companion to Tuscumbia's AM 1590, who put the station on the air in 1962 with 1.3 kW from a site in the Quad Cities area. In the early days when Elton H. Darby ran the stations, it mostly programmed Country music separately from the AM. By 1977, the station had debuted a big 100 kW signal, programming a Beautiful Music format. In the mid-80's the format moved uptempo to a more Adult Contemporary take, but by '89 it was doing CHR (Contemporary Hit Radio). The station went through a musical transition period in the early 90's, morphing back to Adult Contemporary, but with some Rock, then by the mid-90's it was a Classic Rock and modern Rock hybrid. The year 2000 saw a couple of notable changes to the station. First, WVNA-FM and WLAY-FM switched placed on the dial, with country music landing here while the rock went to 103.5 MHz. Then, later in the year, Darby's stations were sold to Clear Channel. In 2006, Clear Channel engineered a massive frequency rearrangement in north Alabama that allowed this station to scoot over to the Huntsville market, re-licensed to Meridianville. With the move, the country music went to another Florence-area station and this station became an Oldies music station as "Cool 92/94", paired with another move-in from Tennessee. The call sign changed to WQRV in March 2006. 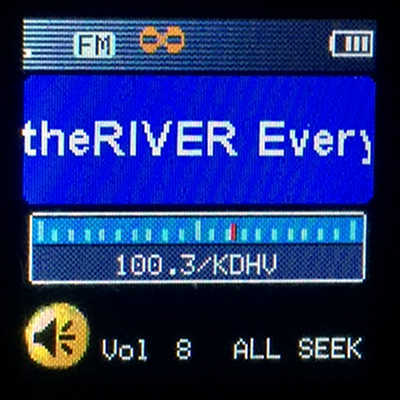 The station later re-branded "The River", and added Rick and Bubba in the mornings in 2008. Later the format morphed from straight-up oldies to a Classic Hits playlist, as "The Valley's Greatest Hits". That in turn morphed into a more wide-ranging playlist with more modern music, with the slogan "Everything's Played Here". After moving to 100.3 the station started broadcasting digitally in April 2006; the subchannel originally featured some type of CHR with Clear Channel's "Hot Spot" format, then later as top 40 dance as "The Kiwi". That was later replaced with a rebroadcast of the company's AM news/talk duo, WBHP/WHOS. In early November 2012, the subchannel and the translator it feeds, W293AH Meridianville, both flipped to all-Christmas music as a precursor to a format change after the holidays. Christmas Day saw the debut of "Kiss 106.5" on the HD-2 and translator, feeding CHR music. The station was to pick up a second HD subchannel that would relay via W225AH in Huntsville, as of August 2018. It went on the air, first stunting as "Trash Pandas Radio", playing baseball songs (to promote the soon-to-arrive minor league baseball team called the Huntsville Trash Pandas) on 12 September 2018. One day later it debuted as "Alt 92.9" with iHeart's Alternative Rock format.